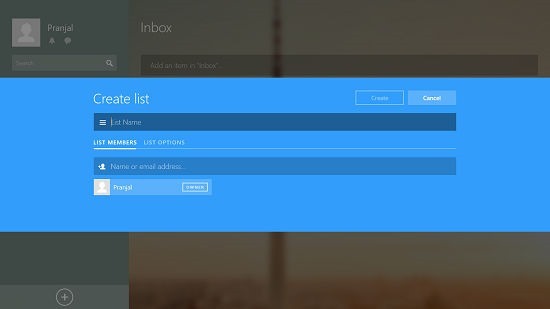 Wunderlist is a free app for Windows 8 and 8.1 which allows you to create and manage task lists on your device. In the app, you can create lists which can be viewed by users with other email ids or you can create lists for your personal use. In the app when you create a list, you will be able to add tasks to the same by adding the task name in the text field at the top which is displayed when you click on the list name at the left pane, and then by pressing the enter key when you have entered the name of the task. You can also prepare grocery lists etc. instead of task lists, and once you have completed an item on the list, simply access the list and click on the check box next to the item to mark the item as complete. 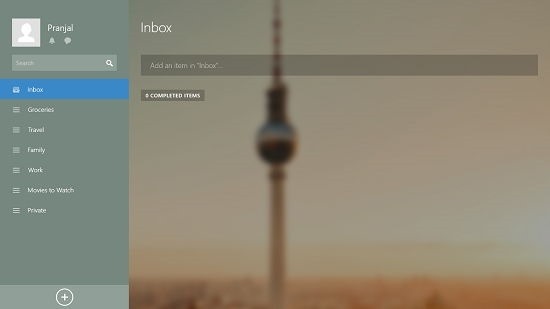 Wunderlist is available for free from the Windows App Store. 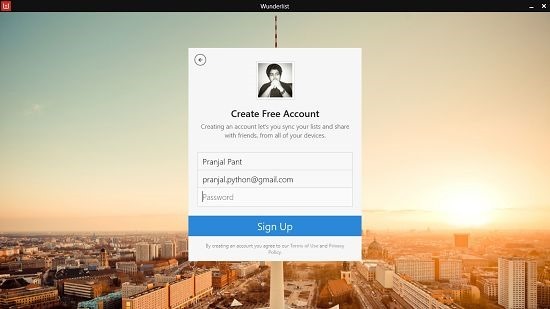 When you run the app, you will be presented with a sign up page wherein you can choose to sign in with either your Facebook or your Google id, and you can also choose to register via your email id. Once you have selected an appropriate option, you will be able to log in to the app. Once logged in, you will be taken to the main interface of the app itself. Here, you can create a list by clicking on the plus button at the bottom left of the screen. 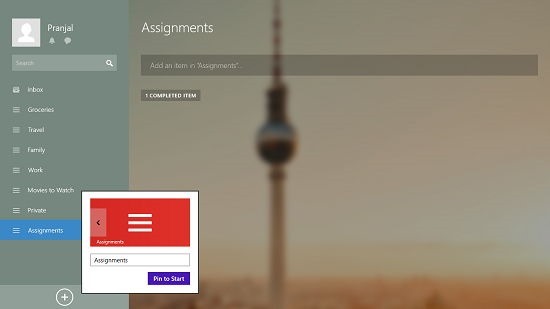 Once that is done, you will be shown a popup wherein you can add the list name, and create or add tasks. You can enter the list name in the above popup, and you can also enter other email addresses with who you wish to share the list items. Once all that’s done, click on the Create button. 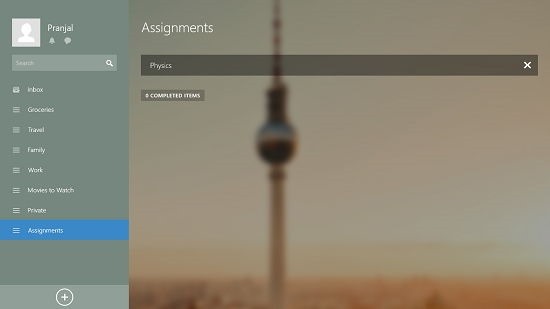 You can start adding items to the list once it’s created. To add an item, simply type in the item name in the text field at the top of the list item interface, and press the enter key. Once the item has been added, you can choose to mark it as complete by clicking on the check box to mark it as finished or done. Completed items are grouped into separate columns as you can see below. The app gives you access to its control bar via right clicking any empty area of the screen. From there, you can choose to pin a list to the Start Screen, etc. You can see that when you choose to pin a list to the Start, you also get to choose its icon! This concludes the main features of Wunderlist. Check out similar apps like Hot Tasks and uCan for Windows 8 and 8.1. Wunderlist is a well designed and pretty well implemented app which allows you to create and share your task lists, grocery lists, etc. with your friends as well or simply keep it for your personal use. I rate it a 5 out of 5!